Alstom presented today the first Citadis X05 tram, which will run on all three new lines Caen la mer (Normandy), in the presence of Joël Bruneau, President of Caen la mer, Rodolphe Thomas, First Vice-President of Caen la mer in charge of transport, travel and infrastructure, and Jean-Baptiste Eyméoud, President of Alstom France. 23 trams were ordered by Caen la mer in November 2016. The first deliveries will begin in October 2018 with entry into commercial service scheduled for September 2019.
proven reliability, will answer the mobility needs of Caen la mer, says Jean-Baptiste Eyméoud, President of Alstom France. The Citadis X05 tram for Caen la mer is 33 metres long and equipped with 6 double doors on each side, enabling it to transport more than 210 passengers. It boasts an elegant design, with passenger comfort in mind, and will benefit from 100% LED lighting, helping create a homogeneous light source, 6 extra-large passenger information screens and large windows covering 45% of the tram. It will also offer USB charging points, a first in France. The Citadis X05 tram for Caen la mer is particularly energy-efficient and will also be able to climb slopes with gradients of more than 8%. It is equipped with standardised, proven and more accessible components, allowing Caen la mers inhabitants access to reliable, readily available material and thus providing the urban community with all the guarantees for the advantageous replacement of its existing system. We wanted the urban communitys inhabitants to adopt this new tram, vital in an urban environment. So, with a view to co-creating the city of tomorrow, the design of the new trams was submitted to the opinion of all the inhabitants of the urban community, says Joël Bruneau, President of Caen la mer. A design committee, made up of elected representatives of Caen la mer, worked with Alstom's Design & Styling teams to submit three different trams to the vote. At the end of 2016, the inhabitants thus had the opportunity to vote for their favourite design via the dedicated website. The design chosen by nearly 40% of the population is efficient, simple and modern. The selected colours wont go out of style and arent just the expression of a fleeting moment. Weve also worked on the brightness of the tram, with large glass surfaces that offer excellent visibility of the city, explains Rodolphe Thomas, First Vice-President of Caen la mer in charge of transport, travel and infrastructure. Eight of Alstom's twelve sites in France are involved in the project: La Rochelle is responsible for the project management, design and assembly, Ornans for the motors, Le Creusot for the bogies, Tarbes for the traction chains, Valenciennes for the interior layout, Villeurbanne for the onboard electronics, Aix-en-Provence for the tachometry and Saint-Ouen for the design. In total, 1,000 jobs will be secured at Alstom and its suppliers. To date, more than 2,500 Citadis trams have been sold to more than 50 cities worldwide, including 23 in France. 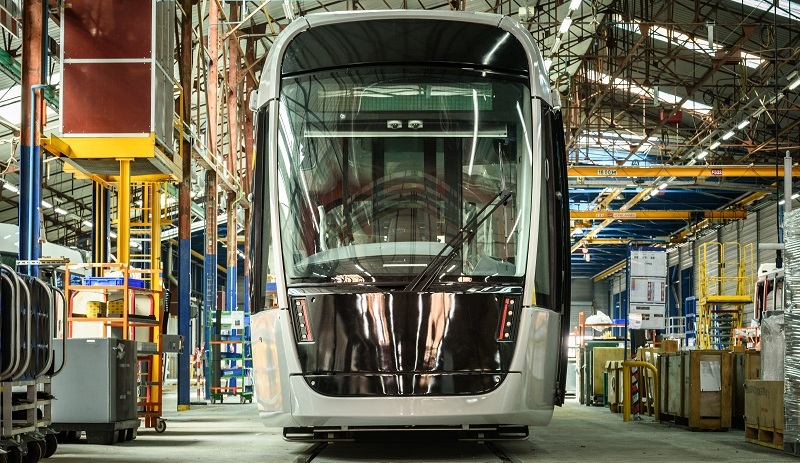 Citadis X05 trams have already been ordered by Nice (France), Sydney (Australia) and Lusail (Qatar).